Tiananmen Square in Beijing is unarguably the stone heart of China. Although technically there are three other public squares in China that are larger, Tiananmen is a seemingly endless plain of concrete and monolithic structures meant to showcase the grand scale of the communist party. The square draws in visitors. Even with 109 acres (440,000 square meters) and a capacity of around 600,000 people, it still feels busy! It can easily reach capacity during big events such as National Day on October 1. 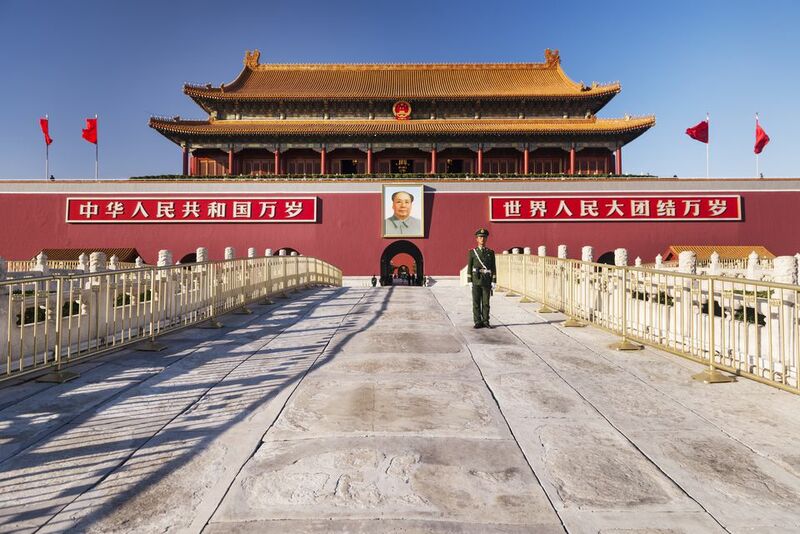 Wandering around Tiananmen Square will invariably become one of the biggest memories from your trip to Beijing. Tiananmen Square is oriented north to south, with the Forbidden City occupying the northern end. The photogenic photo of Chairman Mao and entrance cause the northern end to usually be the busiest. Chairman Mao’s mausoleum and the Monument to the People’s Heroes are located near the center of Tiananmen Square. The Great Hall of the People is in the northwest corner of the square; the Museum of the Chinese Revolution along with the Museum of Chinese History are located in the northeast corner. Despite the enormous size, Tiananmen Square is actually not the largest public square in the world as many claim. It isn't even the largest in China! Xinghai Square, located in the Chinese city of Dalian, claims the title with over 1.1 million square meters — four times the size of Tiananmen Square. Tip: For a classic photo, time your visit for the raising or lowering of the flag at dawn and dusk respectively. The daily sunrise ceremony takes place at the flagpole on the northern end of Tiananmen Square. A sharply dressed color guard and Chairman Mao’s portrait on the entrance of the Forbidden City behind the flag make for some great morning-light shots. But don't be late: the ceremony draws a crowd and only lasts for around three minutes! Tiananmen Square is heavily patrolled by armed and undercover policemen. An abundance of cameras keep watch. Those numerous fire extinguisher stations are not scattered throughout the square just for safety; they are there should someone set themselves on fire in protest. You will need to pass through a security checkpoint while visiting Tiananmen Square. This may include being searched or asked for identification. Have your passport or some form of ID on you at all times. The contents of your bags may be scrutinized. Early June, especially June 4, will bring extra security and volatility around Tiananmen Square as people remember the massacre there. Even in 2014, Amnesty International reported dozens of people under house arrest, detained, or missing in the days leading up to the 25th anniversary of the Tiananmen Square Massacre. You may wish to time your visit for another day. Avoid wearing clothing that portrays any type of political message or theme (e.g., "Free Tibet" shirts). You may as well avoid shirts that depict death or religious themes, too. Any landmark that draws large numbers of visitors also tends to draw large numbers of unscrupulous con artists who prey on them. Remain vigilant but friendly. Students and Chinese visitors may approach you for photos or to shyly ask for an on-the-spot English lesson. Although these encounters are usually harmless, and often fun, don’t commit to going for food, tea or to see an art studio — you’ll likely end up stuck with the bill or be pressured to buy something. Plenty of street hawkers surround the Tiananmen area and will pester you to make small purchases. If you buy from one, you may be mobbed by others. Reply with a firm "bu yao" (don’t want/need it). Some may not take "no" for an answer, so you’ll need to remain firm and walk away from them. Even with many foreign tourists coming before you, Western travelers inevitably wind up receiving lots of attention while walking around Tiananmen Square. You may even get called a laowai or receive some points — these are harmless. Tiananmen Square is lit at night and safe but closes at midnight. Walking around the expanse when it is less busy almost gives the feeling of walking across a concrete desert. Bikes must be walked through Tiananmen Square. Tiananmen Square is located in the center of Beijing; signs in a wide radius point the way. The city’s most famous landmark is so prominent that it's hard to miss! If staying outside of walking range, you can easily reach the square via taxi or subway. A fleet of public buses service Tiananmen Square; however, navigating them can be challenging for an uninitiated visitor who doesn't read or speak good Mandarin. Line 1 (red) is Beijing’s busiest. You can access the north end of Tiananmen Square via the Tiananmen East (Xi) and Tiananmen West (Dong) subway stops from Line 1. Both are on W Chang'an Avenue. The Tiananmen East (Xi) stop is nearest — only one stop away — from the popular tourist district of Wangfujing. Line 2 (blue) has one stop (Qianmen Station) on the south end of Tiananmen Square. Taxi drivers in Beijing often speak a very limited amount of English, but all will recognize your mispronunciation of Tiananmen. If that doesn't work, just ask for the “Forbidden City” in English. Tip: Before leaving your hotel in Beijing, do two things: grab a card from the hotel so you can get back without much hassle, and have the staff write where you want to go in Chinese. Showing a driver the card is easier than sorting out the tonal pronunciation. "Tiananmen" means "gate of heavenly peace" but it was far from peaceful in the summer of 1989. Millions of protesters — including lots of students and their professors — had gathered in Tiananmen Square. They questioned the new one-party political system in China and made requests for greater accountability, transparency, and freedom of speech. Following countrywide protests, a hunger strike, and declaration of martial law, tension rose to the point of catastrophe on June 3 and 4. Soldiers opened fire on protesters and ran over them with military vehicles. Official estimates put the death toll at several hundred, however, the Tiananmen Square Massacre is considered to be one of the most censored events in history. Actual fatalities almost certainly reach into the thousands. Following the "June Fourth Incident," as it is known in China, Western countries imposed economic sanctions and arms embargoes against the People's Republic of China. The government also stepped up media control and censorship. Today, popular websites such as YouTube and Wikipedia are still blocked in China.